Practical insights on the five most important traits that high performing EAs of tomorrow must possess, and how to develop and apply said traits. 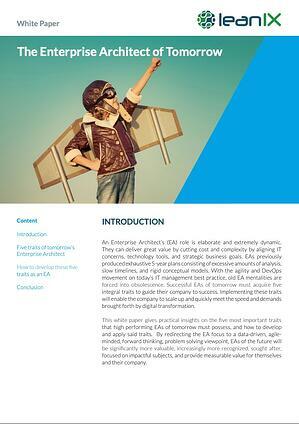 An Enterprise Architect’s (EA) role is elaborate and extremely dynamic. They can deliver great value by cutting cost and complexity by aligning IT concerns, technology tools, and strategic business goals. EAs previously produced exhaustive 5-year plans consisting of excessive amounts of analysis, slow timelines, and rigid conceptual models. With the agility and DevOps movement on today’s IT management best practice list, old EA mentalities are forced into obsolescence. Successful EAs of tomorrow must acquire five integral traits to guide their company to success. Implementing these traits will enable the company to scale up and quickly meet the speed and demands brought forth by digital transformation. This white paper gives practical insights on the five most important traits that high performing EAs of tomorrow must possess, and how to develop and apply said traits. By redirecting the EA focus to a data-driven, agile-minded, forward thinking, problem solving viewpoint, EAs of the future will be significantly more valuable, increasingly more recognized, sought after, and provide measurable value for themselves and their company.